Aaron Martin and Gabriel Johnson struck within eight minutes of each other in the second half to give Brighouse Town a 2-0 win at Glossop North End in the FA Trophy’s extra preliminary round yesterday. 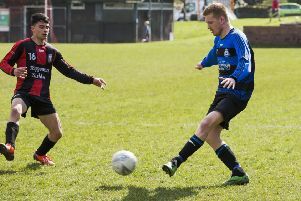 Last season’s leading scorer Martin showed great determination to beat a defender to the ball and slide it under the keeper for the opener on 52 minutes. Johnson cashed in after a good ball over the top from Thomas Robinson, controlling well and firing into the bottom corner from 20 yards. Victory over rivals in a parallel Evo-Stik NPL section earns Brighouse, who are now unbeaten in four games, a trip to Morpeth on October 13. Town now turn their attentions to a home league game against Stockbridge Park Steels on Monday. Brighouse are fourth and Steels, who drew 1-1 at Tadcaster Albion on Saturday, are 12th.